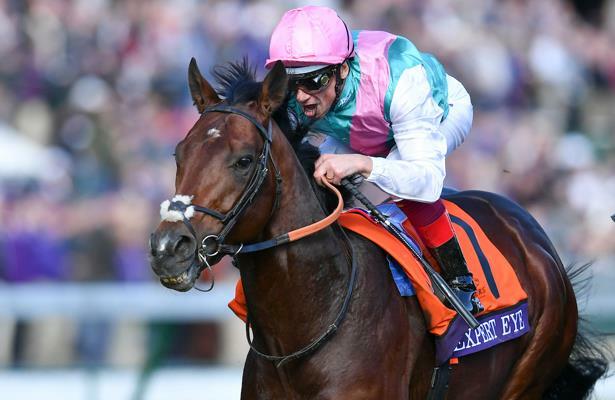 Juddmonte Farms on Friday announced its 2019 stud fees for a European roster of stallions including the recent Breeders' Cup Mile winner Expert Eye, who will stand beside the great Frankel at Banstead Manor Stud. "He is the first British-trained winner of the Breeders’ Cup Mile since 1994, further strengthening one of the most exciting young stallion rosters in Europe," noted stud director Simon Mockridge. “This precocious, athletic and well-balanced colt is one of the best sons of Acclamation to race, winning the Vintage Stakes that was described by Timeform as ‘arguably the most striking performance by a 2-year-old in a Pattern race all year.’ That early talent was carried over into his three-year-old season when he captured the Jersey Stakes at Royal Ascot in scintillating fashion, winning by the largest margin this century," four and a half lengths. “Expert Eye is a fourth generation Juddmonte homebred whose pedigree boasts the presence of Champion 2-year-old Filly in Europe and dual Classic winner Special Duty and seven-time Group 1 winner Sightseek. He is by Acclamation, a consistent and prolific source of fast horses and the sire of leading stallion Dark Angel. “We would like to extend special thanks to Sir Michael Stoute and the teams at Freemason Lodge and Beech Hurst Stables for guiding and developing the career of Expert Eye with such skill." Franked reached 20 Northern Hemisphere group winners faster than any European stallion in history, according to Juddmonte, while Kingman's first crop has already produced five stakes winners.